Bed Side Table Emboss Painted - Wooden Bed Side Stool Emboss Painted With one drawer is highly decorated. This product has outstanding carving, and color combination on exterior. 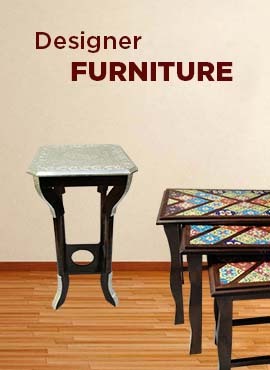 It is perfect to put your table lamp or book on the top and for storing items drawer is fitted to this stool. There is small shelf for storage. Its height of 60 cm, Width 40 cm and Depth 35.5 cm. It weighs 7.8 Kg. Its drawer has dimensions of 7 by 25.3 by 28 cm.